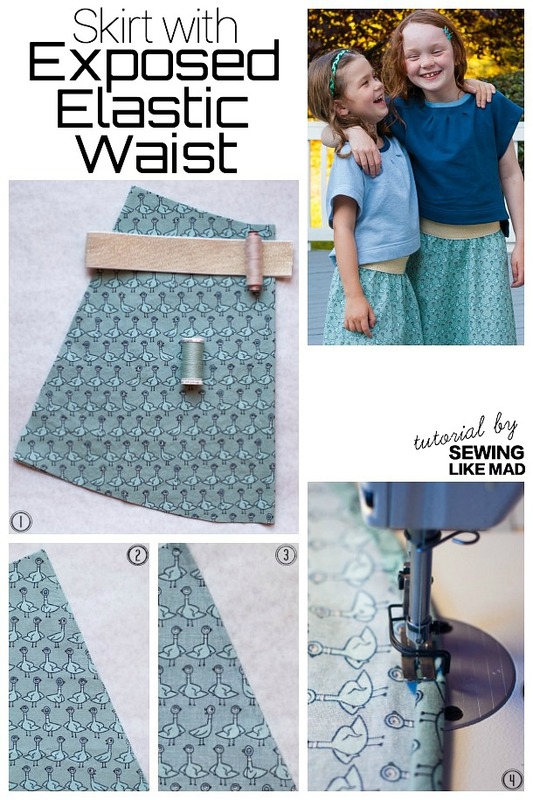 Sewing Like Mad: Skirt with Exposed Elastic Waist - Tutorial. Okay, this is almost ridiculous! These photos are like a year old but luckily sewing techniques don't expire overnight and a skirt with (exposed) elastic waist will probably never run out of fashion. And Mo Willems Pigeon is certainly a classic soooo I think we are good. So a long long time ago I promised to make a tutorial on how to make a simple skirt with an exposed wide elastic waist (and a nice clean finish on the inside). I have here used the 1.75" (4.4 cm) wide gold elastic from Dritz. It also comes in other metallics and colors* and this is not an affiliate link, I just totally love that product. It is soft but not too soft...in other words...just right for a project like this. *The colored elastic is 1.5" / 3.8 cm wide. The pattern is very very simple. Use something similar to the shape above in photo (1) or draft it yourself if you are familiar with basic pattern drafting methods. 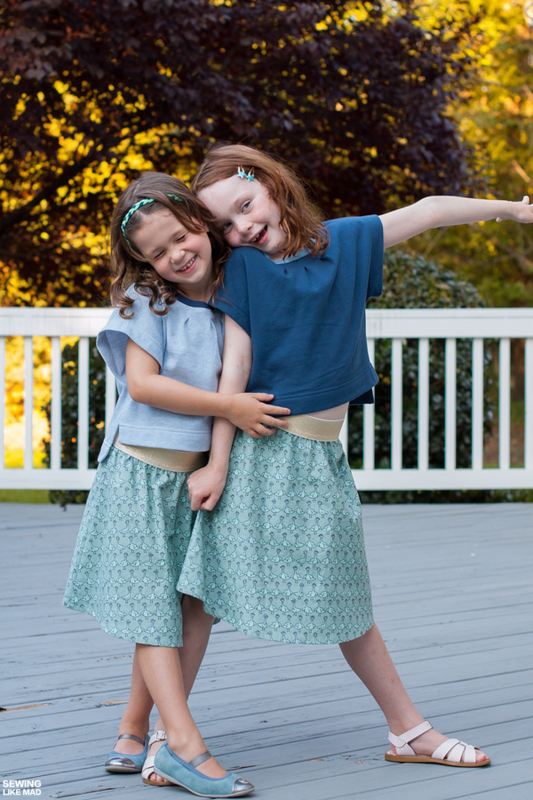 Here is a very fast walk through on how I drafted the pattern: I started with a rectangle with the wanted length of the skirt (plus preferred SA's top and bottom/hem). The width I found this way: You take your child's hip measurement + 10-15 cm (4-6") and then divided with 4. Then slash and spread your rectangle from below, add your preferred SA to the side seam (the other side is to 'cut to fold') and you now have a pattern piece which you need to cut two times on the fold for a front and back piece. (1) Here you see the skirt cut in fabric. Right side is to fold and there are two skirt pieces total. The gold elastic and then matching thread both to the skirt fabric and the elastic. 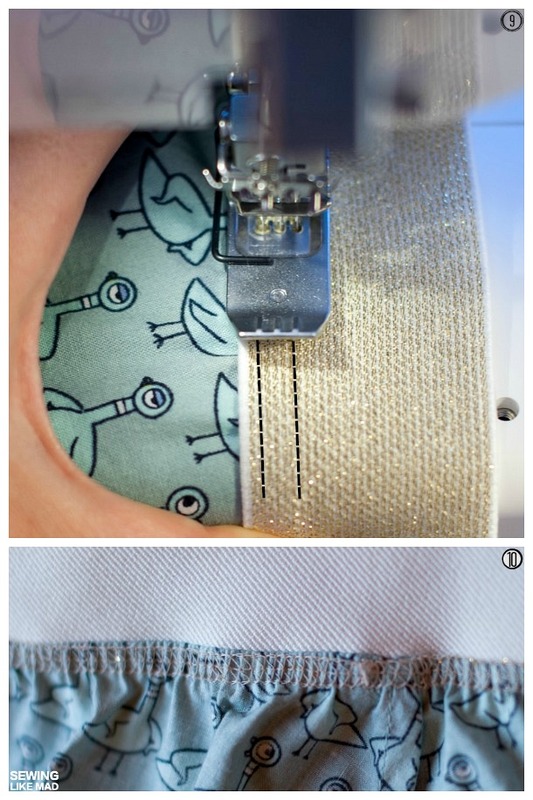 Sewing on elastic (especially with domestic machines) can (not necessarily) become a little bit wobbly, so you really want to mask the stitches as much as you can and matching thread is the way to go there. (2) and (3) are basically me telling you to sew the side seams of the skirt and I'm showing you, how you can also do a French seam in a tiny bit easier way. In (2) I have serged the side seam with a 3 thread (so it's narrow) overlock seam and the fabric wrong side against wrong. Then a quick ironing and in (3) I closed up the French seam just like you always do, fabrics right side against right side. Now iron the side seams! Yes, that's an order...don't connect or hem or do anything with un-ironed seams. It's the first step to homemade looking clothes the bad way. 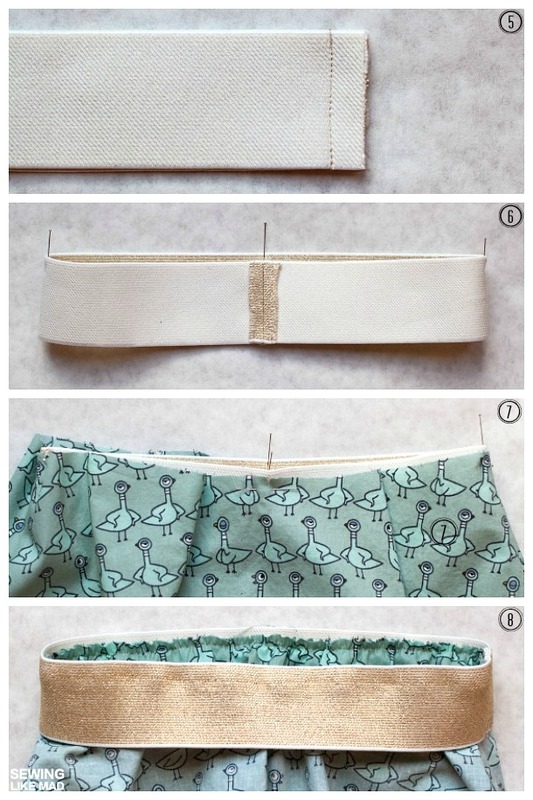 (4) Hem the skirt your preferred way. I fold, fold and stitch. 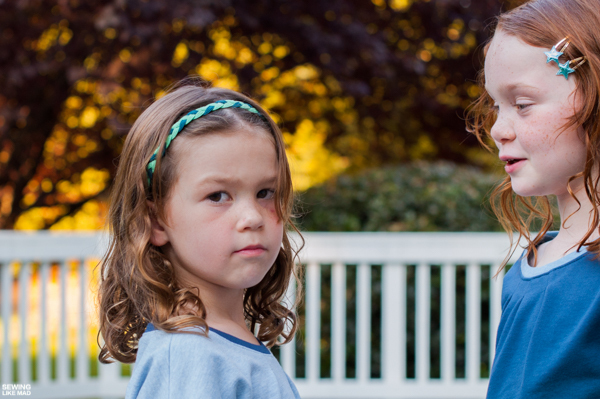 (5) At this point you have measured your child with the actual elastic to make sure it fits who is going to wear it. Close up the ends with a stitch and your preferred SA x 1.5 (Why is explained in the next step). (6) Now it might be hard to see in this photo but I'm also folding in the raw edges of the elastic and stitching down the SA (another reason for matching thread) so the finish is nice on the inside of the elastic/waistband too. Then divide your elastic in quarters. (7) Do the same with the top of the skirt (divide in quarters) - which will obviously have a bigger circumference at the top - and then connect the 4 points with pins with wrong side of elastic with wrong side of the fabric AND with the top of your fabric pushed down a few millimeters from the edge of the elastic. I also prefer to place the one seam on the elastic at one of the side seams. It hides better there I think than CB. (8) Now you are ready to sew. Start at one of the quarter points, then put your sewing machine needles down through the fabric and elastic and then stretch out the elastic so it becomes same length as the fabric/skirt and stitch to the next quarter point. As you can see you are sewing about 1 cm (3/8") from the elastic's edge and about half of that from the fabric's top edge. Repeat this process until you are all the way around and back to where you started. (9) Now you flip up your elastic, flatten the seam gently with your iron and sew another stitch (here done with a cover stitch but that is not absolutely necessary) from the front of the elastic. This will hide the raw edge of the top of the fabric inside the seam. (10) A look at how neat it look on the inside. Give it a good steam ironing on the elastic only and you are done. 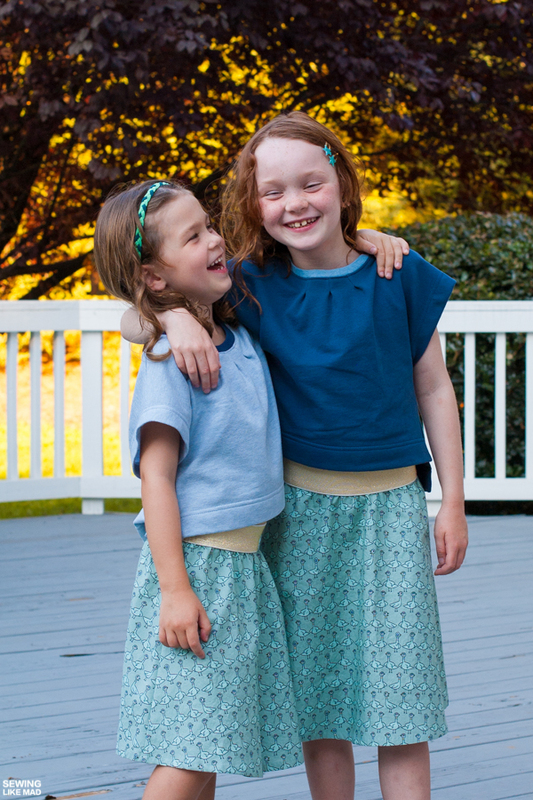 These skirts were (and still are) quite popular in this household. 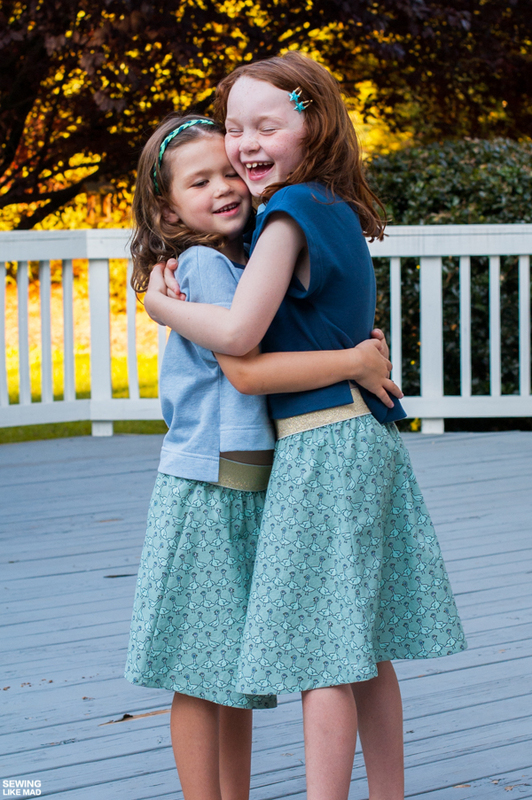 Mo Willems' Elephant & Piggie books are the absolute favorite of his books but since The Pigeon makes an appearance at the end of every book (and that was the only fabric we could get) these skirts were, as mentioned, received with cheers and enthusiasm from the little ladies. The fabric is organic (quilting) cotton from Cloud9 Fabrics. HERE is a link to the entire collection from 2013, although I know this particular fabric is sold out a lot of places. But give it a try with google and see what comes up. A close up of the exposed elastic waist. As you can see, the matching thread for the elastic colors makes my stitches almost disappear. Someone was really ready for this shoot, hehe. The tops on the other hands have not been popular with these ladies. In fact they have never been used since, wah. 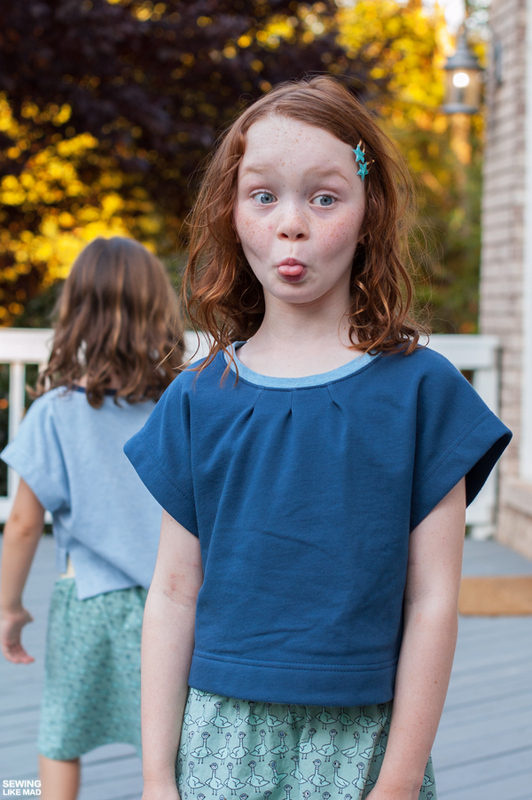 It's based on the Celestial Tee from Figgy's Patterns but with a few moderations. 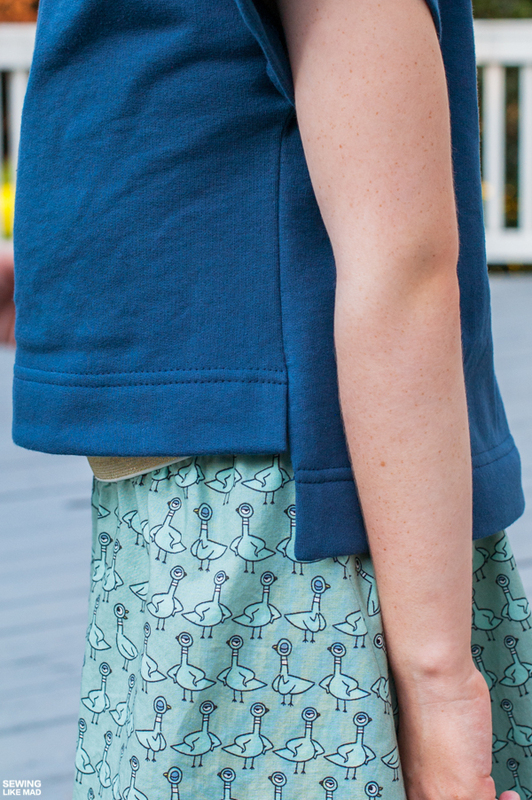 I made it wider and shorter than the original pattern and then a high low hem with a side slit which I remembered as one of the options from Titchy Threads' Hawthorn Zip-up Sweatshirt. I think the biggest mistake I made with these, were to make them in sweatshirt fleece. The style is a summer style but my silly fabric choice makes them too warm for our scorching summer temps. Maybe I can try to sell them for the winter months with a long sleeved tee under?! Close up of the high low split hem. For more tutorials check my tutorial page. Cute skirts! And super cute shirts! I hope they can wear them in fall winter! I love the skirts and the tutorial is just perfect. Now I can finally make some skirts because you know I have been waiting a year for this, hahaha! ;) And those shirts!!!!!! OMG I couldn't take my eyes off them! I really hope your girls wear them in the fall because they are wonderful. In fact, I want them for me! awwww, I am melting too <3 It is a pity they did not fall in love with tees. 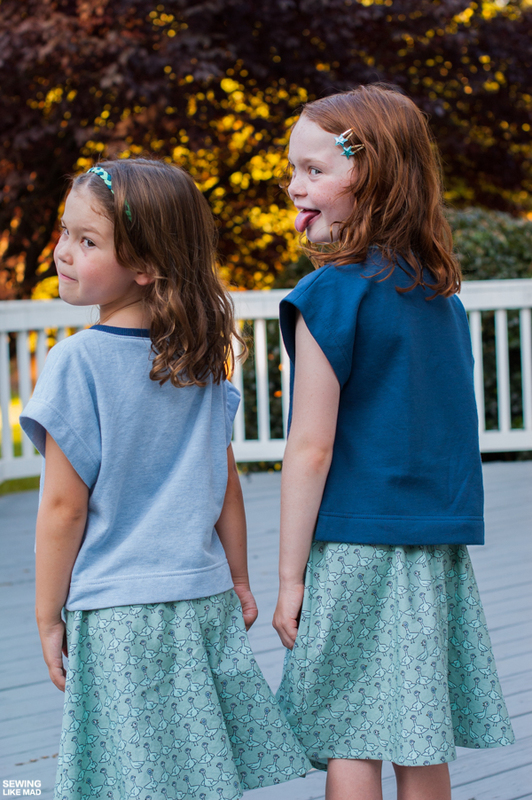 I hope these tees will be accepted as layering options over cooler months :) The skirts are super cute! that is really beautiful! I did this already once, but didn't do it this way, and this looks much cleaner! thank you for the tutorial! and what a lovely pictures!!! especially the last one!! <3! !